As southeastern Wisconsin is running low on blood, the West Bend High Schools’ anatomy classes are coming to the rescue. After Slinger High School dropped out of their annual blood drive due to construction at their school, West Bend science teachers David Clark and Kara Petzold decided to create a blood drive revolving around the anatomy classes they teach. Each student in anatomy class is responsible for bringing at least one person to donate blood, taking over Slinger High School’s obligation of donating at least 100 pints of blood to the Blood Center of Wisconsin. The blood drive is the morning of March 6 inside the WBHS south gym and is designed as a class project rather than a community drive. The anatomy students are personally inviting and educating people about blood donation. Anatomy students themselves can volunteer to donate blood, or they can bring a classmate or community member to donate. The anatomy classes are not only creating a meaningful impact in southeastern Wisconsin, but are receiving an educational benefit as well. The blood unit will be taught in anatomy around the same time the blood drive will occur. The blood drive committee consists of the anatomy teachers and students chosen to help organize the blood drive. They hold weekly meetings in order to plan the day of the drive, and connect with the members of the Blood Center of Wisconsin. East junior Emily Kolb, an anatomy student, decided to join the blood drive committee in an effort to help the community. Payge Hochstaetter, also an anatomy student and East junior, saw the opportunity to be on the blood drive committee as a unique way to give back. Winter proves to be a difficult time for collecting blood donations in Wisconsin. Southeastern Wisconsin needs about 300 pints of blood a day to break even. Due to bad weather conditions and school closings, many people are unable to go to blood centers to donate. Combining these circumstances with an increased number of car accidents from harsh weather conditions, the need for blood continues to grow each day. Many blood centers rely on high school and college students to donate through these types of blood drives, making the anatomy blood drive even more meaningful. 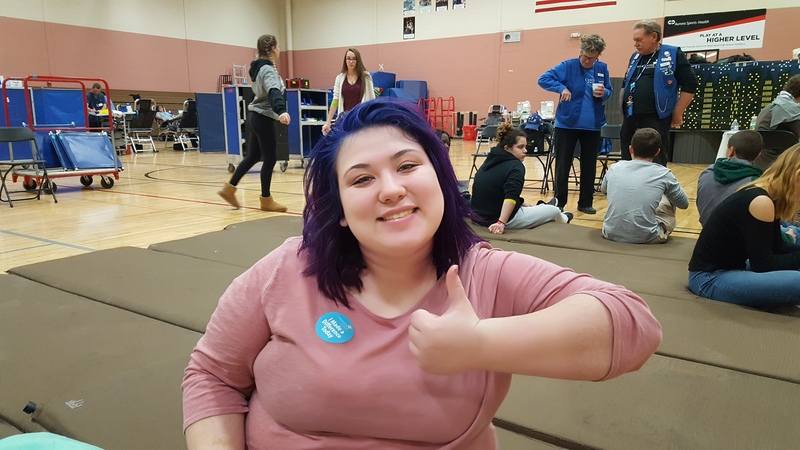 West senior Serenity Krueger donates blood Dec. 13 at a drive hosted by the WBHS student council in partnership with the Blood Center of Wisconsin. Photo by Jessica Steger, Editor in chief.